Two proteins engineered to form a cage structure. Scientists are great tinkerers, and surprisingly, proteins can often be used like tinkertoys. The proteins found in cells have evolved to have a stable, folded structures. Scientists are now building on these stable proteins and making changes to engineer new functions. These functions include designing new enzymes, designing proteins with improved medicinal properties, and designing large complexes with a desired shape and size. The structures shown here are the result of tinkering with natural proteins to achieve a new goal. Todd Yeates and his collaborators wanted to build a self-assembling nanoscale cage, for use in nanotechnology applications such as the delivery of drugs. The goal was to create a complex with a defined symmetry: a tetrahedron. The symmetry of the tetrahedron requires two types of interfaces between the pieces: a three-fold interaction at the pointed vertices, and a two-fold interaction along the edges that connect the vertices. The molecules shown here are the result of taking two different approaches to the design. The first approach relied on Nature for both of the interfaces. The protein bromoperoxidase normally forms a trimer, so it was used for the vertices, and the M1 virus matrix protein is normally a dimer, so it was used to create the edges. The trick was to connect these two proteins in exactly the proper geometry. This was done by creating a fusion protein, designed so that a continuous alpha helix forms between the two proteins, fixing them in the proper orientation. When these proteins are synthesized, they self-assemble into a cage-like protein with a large cavity in the center, shown here at the top from PDB entry 3vdx . In the illustration, the long alpha helix in each protein subunit is colored slightly lighter. The second approach, shown here at the bottom from PDB entry 4egg , built the dimeric interface entirely from scratch. David Baker and his collaborators used the trimeric enzyme galactoside O-acetyltransferase for the vertices, and designed mutations that would create a stable interface between each trimer. The result is a more compact tetrahedron, with a smaller cavity in the center. 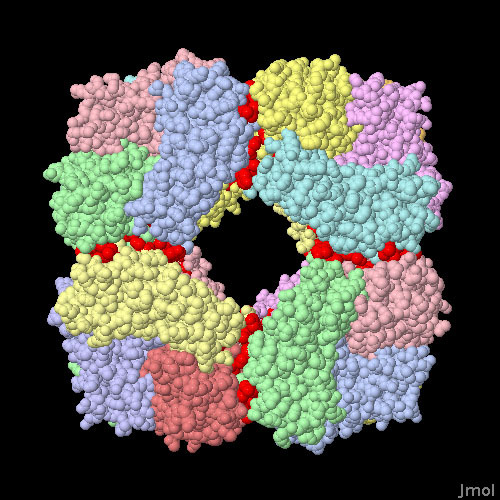 A cytochrome protein engineered to form a two-dimensional lattice with the assistance of zinc ions (red). Researchers are attempting to build all types of structures from protein components. For instance, the structure shown here, from PDB entry 3tom , is a continuous two-dimensional lattice built from an engineered version of a normally-monomeric cytochrome protein. The engineered proteins have several sites of mutation that bind to zinc ions (shown in red), which link the subunits together into the lattice. 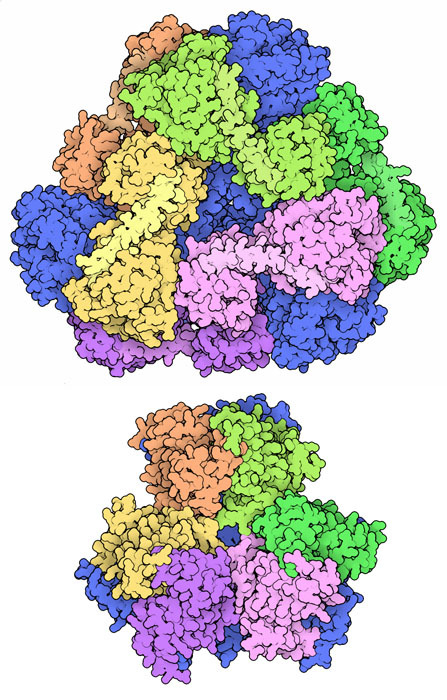 The RosettaDesign method was used to design interfaces for two self-assembling protein cages, the tetrahedral one shown earlier, and an octahedral one shown here from PDB entry 3vcd . It is built from the bacterial protein PduT, which is normally a trimer. New interfaces were engineered to connect up each of the edges of the cube-shaped structure. To explore this structure and the designed interfaces in more detail, click on the image for an interactive Jmol. You can compare the natural proteins with the engineered proteins using the Compare Structures tool. What are some of the advantages (and disadvantages) of building large structures using symmetrical components? 3vdx: Y. T. Lai, K. L. Tsai, M. R. Sawaya, F. J. Asturias & T. O. Yeates (2013) Structure and flexibility of nanoscale protein cages designed by symmetric self-assembly. Journal of the American Chemical Society 135, 7738-7743. 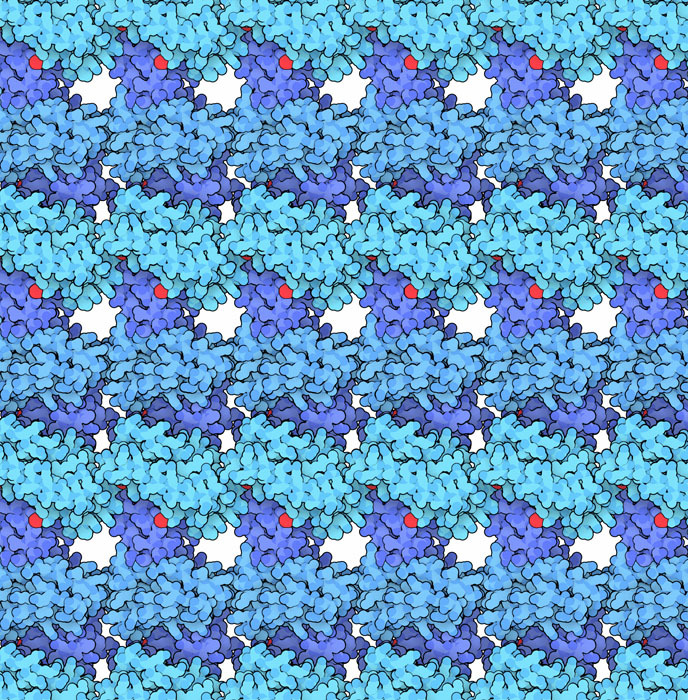 3vcd, 4egg: N. P. King, W. Sheffler, M. R. Sawaya, B. S. Vollmar, J. P. Sumida, I. Andre, T. Gonen, T. O. Yeates & D. Baker (2012) Computational design of self-assembling protein nanomaterials with atomic level accuracy. Science 336, 1171-1174. 3tom: J. D. Brodin, X. I. Ambroggio, C. Tang, K. N. Parent, T. S. Baker & F. A. Tezcan (2012) Metal-directed, chemically tunable assembly of one- two-, and three-dimensional crystalline protein arrays. Nature Chemistry 4, 375-382.